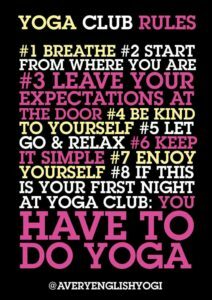 The third of the yoga club rules is: “Leave your expectations at the door”. It sounds like a line from a Bob Dylan song. But it’s pretty fundamental to yoga practice, and maybe life too. And for a yogi, yoga is life and life is yoga so its inseparable. The premise of this is that if you don’t have any expectations you will be fine and you may find yoga an intriguing and interesting realm of possibility and potentiality. It is possible that you might have these side effects from practicing yoga. But then again, you might not. The most helpful, easy and fun way to approach yoga club, or yoga more generally is to adopt a spirit of curiosity. The word curious originates with a meaning of “with care” or being cautiously careful. To me it is an openness but with care and consideration. When i think of curiosity in yoga, I always think of my lovely yogini friend Kit Hartley who teaches in Lancashire. She says things like “what would happen if you did this?”, or “how would you feel if you moved like that?” or “just see how you are, or what happens when you move in this direction”. By asking people to consider and explore, Kit enables people to see the potential and the possibility. Which is what I think yoga, and life is all about. If you are exploring any aspect of yoga -whether it is asana (postures), or breathing, or perhaps mantra – or maybe a kriya like jala neti – maybe start with a sense of curiosity: “what would happen if I did this, or that”? You see if you set a measure or raise a bar of expectation, it’s likely that you may end up disappointed. Or confused. Or maybe frustrated. And who knows what will happen if you try a particular asana, or pranayama, or maybe read some scripture without any sense of expectation. I mean, just explore it and see what happens? The possibilities are endless. This is a yoga club rule, but A Very English Yogi does actually apply it to life. So that big gardening job? Let’s start on one small patch, and see what happens. That essay? Start with a sentence and see where it leads you. That project. Let’s see where we can go with it. That marathon? Let’s see where you get to and how you are? The cold water, open water swimming? Dip your toes in and explore it from there. So chuck those expectations in the bin. Instead start with curiosity. See where it leads you. Who knows – maybe you might be pleasantly surprised.